I’ve written a new book on human genetic modification. This is my second book as the first one was Stem Cells: An Insider’s Guide, which is currently the top stem cell book on Amazon. 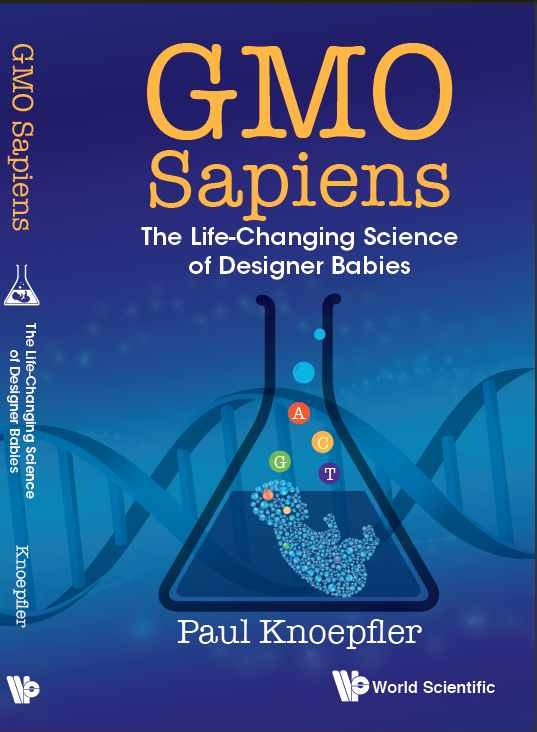 The new book is called GMO Sapiens: The Life-Changing Science of Designer Babies. You can pre-order it here at Amazon or over here at my publisher’s site. The newly updated cover is shown at right. The title was chosen as a portmanteau (mashup) of GMO and Homo sapiens. We’ve been aiming for the book to come out in mid-late December. I’m optimistic based on what I hear from the publisher, but we’ll see. The science in this area has changed dramatically and both the wider scientific community and the public need to know what is going on so that they can participate in the dialogue. Unlike in past decades, today the possibility of heritable human genetic modification is very real. Based on all that we now know it is reasonable to predict that someone will attempt to create genetically modified people (aka designer babies) in coming years. The results could be great or disastrous, but in either case (or probably more likely some mixture of the two) the outcomes are going to be revolutionary. Are we ready for what may come next? How will this affect individuals and society as a whole? More thinking, discussion, and transparency are urgently needed. The goal of this upcoming book is to move in a constructive direction by educating and stimulating debate as well as dialogue. At the same time in the book, I am not afraid to tackle the real, but tough issues that are integral to this topic. It seems that up until now in science it has been somewhat taboo to talk about the possibility of designer babies. However, we don’t have time to close our eyes to the reasonable probability that someone will try to make designer babies in the near future nor to pretend that nothing could go wrong for individuals or society. Already this year we saw the creation of the first genetically-modified human embryos in the lab using the amazing gene editing toolbox that is CRISPR. That is just one step, but may have opened the door to much more. Genetically modified organisms (GMOs) including plants and the foods made from them are a hot topic of debate today, but soon related technology could go much further and literally change what it means to be human. Scientists are on the verge of being able to create people who are GMOs. Should they do it? Could we become a healthier and ‘better’ species or might eugenics go viral leading to a real, new world of genetic dystopia? GMO Sapiens tackles such questions by taking a fresh look at the cutting-edge biotech discoveries that have made genetically modified people possible. GMO Sapiens: The Life-Changing Science of Designer Babies. It looks a good and knowledgeable book. this book should be free to access. Congratulations. It appears to be an important book for the times.